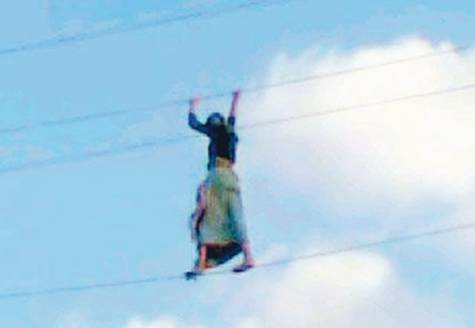 A Saudi man walked on an electric wire to protest frequent power cuts in his community. The man said that he wanted to prove that the wires often did not carry electricity. Women and children in Nepal stage a demonstration to protest against human trafficking. In Copenhagen, tens of thousands of people demonstrated outside Parliament to protest the Danish government’s three-year austerity package. An Irish nurse sat atop a ladder for seven hours to protest her family’s eviction from their home for back-rent. Thousands of priests from around the world rally in Rome in support of the Pope. More than 5,000 Guatemalan peasants blocked a border crossing with Mexico in protest against constant power outages in parts of the western province of San Marcos. Too bad the rally in Rome couldn’t include women as well as men. That highwire act was really effective.